In my research on effective use of Large Scale Interventions, I developed an evaluation instrument. It is based on audit methods for assessment of quality management systems, such as ISO 9000. The ‘norm’, the set of quality criteria, has been built from a synthesis of existing evidence from experience and theory. 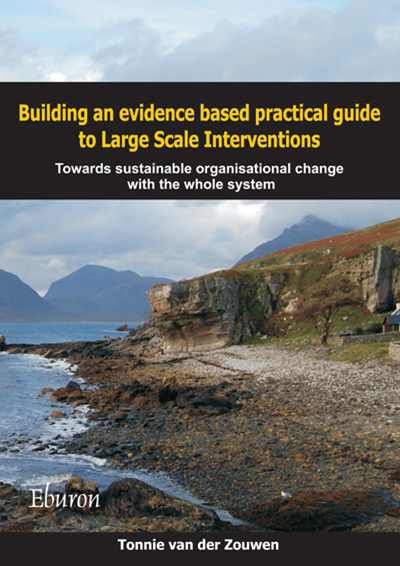 Read more in my book Building an evidence based practical guide to Large Scale Interventions. Towards sustainable organisational change with the whole system. If you want to evaluate a Large Scale Intervention process, or another complex intervention for organisational change, this method might be of use. On this site you can download the evaluation instrument and additional forms with audit questions, score table and score chart. They are available for free, but please honour my work by mentioning my name and copyright.